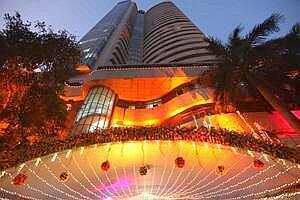 Mumbai: The Diwali spirit didn’t light up Indian equities despite traders and fund managers putting up a brave front. At the traditional Muhurat trading, the BSE Sensex opened about 70 points up, but the gains petered out after a while. To be sure, muhurat trading isn’t always an indicator for what happens in the Samvat year. Only a token trading takes place and mostly for religious reasons. In the past five years, except for a 5.86% spike in 2008, the Sensex has move only about 0.4% on Diwali trading. “Expectations are quite low right now but I have a sense that this is the bottom or we are very close to it," said Ved Prakash Chaturvedi, CEO L&T finance. “The interest rate cycle will peak in the next six months or so and markets will not wait till that point." In the past Samvat year, the Sensex dropped about 19%, the second worst in 10 years. But then this was driven by a host of factors such as a slowing economy at home due to high inflation and interest rates, falling company profits and dropping investments; foreign investors too shied away from equities because of the debt crises in Europe and pale economic growth in the US. “Risk aversion is quite high," said Ambareesh Baliga, CEO of way2wealth. “Bad news on both the domestic and overseas fronts are already there in the price. If there is any positive (news) that happens, the market will move up." These factors haven’t changed much albeit the Reserve Bank of India adopting a more dovish tone in its monetary policy statement yesterday. But some pointed out that no two consecutive summers have been bad for local equities. Others went on to say that markets will scale a new high. The consensus among fund managers and traders is that interest rate-sensitive sectors such as banks, capital goods and infrastructure would be among the first ones to bounce back. On Wednesday, however, capital goods, public sector unit and healthcare stocks led the gains sentiment.